While the Korean automaker may not be known for its luxury models, that is fast changing as Hyundai works to up the ante and compete with others in the segment. 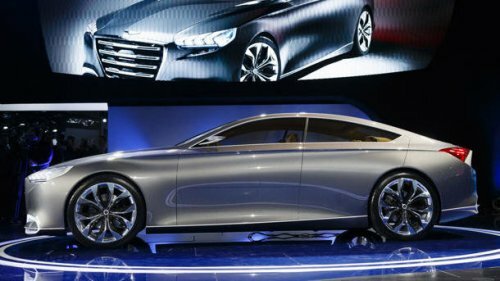 The HCD-14 Genesis concept that debuted at the North American International Auto Show (NAIAS) yesterday was the next step in that process. And what a step! The global unveil of the new luxury sedan showcased the car's innovative design elements - many of which will translate into the automaker's future sedans. While the unique and eye-catching, pillar-less suicide doors are often the focus on first look, those will not likely translate into a production vehicle whereas the beautiful styling cues, hinted at earlier this month very quickly become the focus once the shock has worn off. Hyundai says that the company plans to further differentiate its luxury offerings from its mainstays using branded styling and the HCD-14 is the concept that will propel those going forward. The next-generation Equus and the Genesis, debuting next year, will show these cues in action on production vehicles. Hyundai Motor America's CEO, John Krafcik, made it clear that these aren't the only ones. He's promising another premium model, as yet unnamed, to come soon - the only detail given was that it would not be a crossover. He also said that while rumors have said there might be a Hyundai luxury brand coming, the company has no plans for that in the near future. He cited the "halo effect" that having the luxury and standard models on the same dealership lot with the same sales force requires of dealerships, who must then step up service to match. The design elements of the HCD-14 Genesis concept reside in its sleek body shape, and simplified yet refined lines. A singular line carries from the fender across the doors, just underneath the belt, to the corner of the rear lamps. At the bottom third of the doors, a slight bevel creates a hint of running boards and cleans up the straight line across the bottom, which finishes an overall square appeal to the bodywork. That squared symmetry comes from the straight nose and rear bumper and deck. Those flow upwards to a rounded roofline and tapered hood. The LED headlamps, straight-striped grille, and simple ridgeline down the middle of the hood complete the overall appearance of simplified refinement for this great-looking car. A rigid chassis with several refinements over the current-generation Genesis gives a stable platform into which the large 5.0-liter direct-injected V8 rumbles through to the 8-speed transmission. As the wide-swinging double suicide doors would attest, the interior of the HCD-14 is a primary focus. Futuristic technologies available today include the eye-tracking system, thumb controls, and 3-D hand gestures that replace the traditional button and knob dashboard. The centralized infotainment system is augmented by a windshield heads-up display system to keep the driver's eyes on the road. This is how Hyundai envisions all of its future vehicles operating inside, but must admit that it will require some getting used to for many of us. The plush interior has all of the luxury fittings expected of the Equus and Genesis models, which compete against some of the mainstays of the market from Lexus and Lincoln. “We’ve departed from industry convention in many of our premium product, marketing, sales and service approaches, and it’s worked out pretty well, with Genesis and Equus now delivering a 9% retail market share in their premium segments, higher than the 5% retail share Hyundai brand achieves in the overall industry,” Krafcik said. Genesis sales in the U.S. grew to 34,000 in only four years, fromh 2008 sales of barely over 6,000 units. That increase in market share seems to prove Krafcik's point as the Korean maker continues gaining inroads into the premium market. Adding a third shift at its Alabama operations has helped reduce its unexpected capacity strain and the company has plans in the works to further improve U.S.-based manufacture operations to continue keeping up with growth demands. The future for Hyundai indeed looks to be coming into HCD focus.